Would you love to write more regularly? But struggling to find time? Sometimes it feels like unknown forces are conspiring against us. We start the year with good intentions, but before the end of January we’ve given up. We don’t have enough time. We don’t have enough energy. We’ve quickly run out of blog post ideas, lacking inspiration. When I was in a corporate job, I didn’t understand the concept of procrastination. I got things done. But since starting to work from home, Procrastination has become an unexpected good friend. Together we’ve spent hours on Twitter, we’ve kept up to date with the latest news (minute by minute! ), we’ve messed about for days trying to avoid difficult tasks. Initially, Procrastination and I were good friends. After all, I was meant to take it easy. Didn’t I deserve some time off? I wanted to do something valuable. Learn something new. Create stuff. I didn’t want to spend my time aimlessly wandering around the web, destroying my motivation and feeling bad about myself. Since the end of 2012, I’ve been writing regularly. In the beginning, it was a struggle. And these days, my friend Procrastination still joins me occasionally for a cup of tea and some aimless internet browsing. But she now spends most of her time with her best mate—Mr Writer’s Block. I don’t want to join their party anymore. I have better things to do than listening to their chitchat. I’d rather get work done or go out for a walk. Want to do the same? 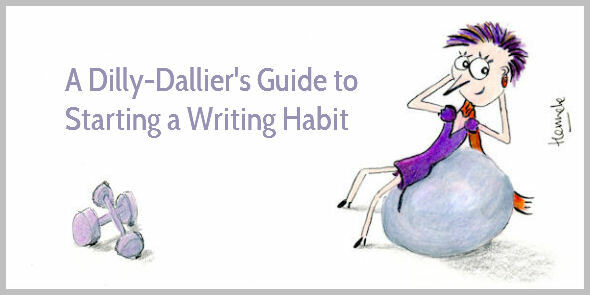 And start a solid writing habit, too? Busy-ness is a major threat to developing a new habit. Your diary is already full, and trying to cram in more work is setting yourself up for failure. If you want to write more, what are you going to do less? Can you spend less time on Facebook? Less time watching TV? Monitor and write down how you spend your time for two or three days. Then decide what activity you can cut to make time for writing. Next, note down how writing will contribute to your goals this year. Do you want to find more clients? Grow your email list? Deepen your understanding of a topic? Inspire more people with your advice? Do you believe more writing will help you realize your goals? You decide your priorities. Make writing a high priority. It requires more brain power than answering emails, so do it while you’re still energetic. I’m a night owl, and I struggle to get started in the morning. I don’t drink coffee. So I kickstart my body (and my brain!) by going out for a brisk walk in the morning. Create your own ritual. Before I go out for my walk, I switch my computer on. If it’s already on, I close all browsers. The only document left open is what I have to write. When I get home from my walk, I make a cup of tea, and I start writing. You might want to put on your writing shirt or your crazy hat. You might want to listen to your favorite song while drinking your favorite tea. Create a ritual to prepare your brain, so you know you have to start writing as soon as your ritual is done. Get rid of distractions. I used to think I had enough willpower to focus on my writing. But that’s not true. So, put your phone on flight mode, lock the door, and focus on writing. Commit to a regular schedule. When you joined my newsletter, I told you to expect an email every Tuesday, because that was the only way to force myself to publish. You don’t have to write a blog post weekly. But creating regular deadlines helps you stick to a writing habit. No excuses. Allocate time in your diary. When you don’t block time for writing and editing, it won’t happen. Starting a new habit is tough. So start with a small commitment. If 25 minutes every morning sounds like too much, then begin with 15 minutes or 5 minutes. To start a new habit make the habit tiny—like flossing one tooth. Build your habit step by step. And celebrate your tiny successes. I used to get angry with myself. I thought I lacked willpower. No discipline. But relying on willpower is dumb. Instead, find out what is railroading your writing efforts. For instance, I noticed that each time I wanted to check an online thesaurus, I got distracted. I couldn’t stop myself from checking my email and Twitter. And before I knew it 10 minutes were gone, and I didn’t even remember what word I needed to look up. Now, I keep only one tab open in my browser. Having to open a new tab to check my email is a big enough hurdle not to do it. So I can check the thesaurus without getting distracted by email or Twitter. Don’t forget that developing a new habit takes time. Be kind to yourself. Celebrate your tiny successes by keeping a track record—make a mark every day you’ve kept to your commitment. And when you screw up for one day, accept it. Don’t throw in the towel. Tomorrow, you’ll do better. You might want to write. But what if you can’t think of a topic to write about? Keep an idea book. I prefer a old-fashioned paper notebook, but Evernote is perfect for this, too. When something you read inspires you, make a note. When a client asks you a question, make a note. When you receive an email with a question, write it down. When you listen to your readers and clients, you never run out of ideas. Dedicate 30 minutes to brainstorming blog post ideas. When you’re desperate to write a post, you’ll find it more difficult to come up with a good idea. But when you challenge yourself to generate 30 (or 50!) ideas in one go, your inspiration will magically start to flow. When you keep writing, a strange thing happens. You might think your well of inspiration slowly dries up. Instead, the opposite happens. The more you write, the more ideas you get. When I started writing, I didn’t know what to write. But in the last year or so, I’ve never run out of ideas (touch wood!). But your mind keeps wandering off. You feel you can’t do this. Where should you start? Often we need to trick our mind into getting started. As soon as we write our first sentence, writing becomes easier. Writing is a process. Don’t put so much pressure on yourself. Your first draft is meant to be crappy. You can polish your writing later. Start typing that first word. Writing any words is better than writing none. Try writing as quickly as you can to shut up your inner critic. And if she starts nagging you, tell her she’ll get a chance to help when you start editing your first draft. I often use a timer. It seems like a silly tool. But even bestselling writers like Daniel Pink use a timer to write. I set my timer at 25 minutes. I try to write as fast as you can. I try to stop caring whether my writing is any good. At the end of the 25 minutes, I allow myself a 5-minute break—which often becomes a little longer. To keep your mind fresh, taking breaks is essential. And when you take breaks in the middle of your flow (even half-way a sentence), you find it easier to get started after your short break. Don’t feel you have to write a whole blog post in one go. A blog post consists of parts. A title. An opening paragraph. A main body. A final paragraph. Start with the part you find easiest to write–quite often this not the opening paragraph. Start with a big idea. How will a blog post help readers? Prepare a weekly plan to write your post in the time available to you. If you can’t blog weekly, publish every other week. If you can’t write long blog posts, write shorter ones instead. You might want to build a popular blog. You might want to become a bestselling author. Or you might simply want to learn how to express your ideas. But lofty goals don’t help you create a writing habit. Instead, put in the work. Word by word. Sentence by sentence. Build your stamina. Grow your confidence. Paragraph by paragraph. Blog post by blog post. And enjoy playing with words. I thought of the Raymond Chandler writing process. He’d set aside 4 hours a day to write. He didn’t have to write, but he couldn’t do anything else. Write or nothing. He had it a bit easier with no access to our many distractions, but still, not a bad principle to follow. For me, it only works if I cut my writing time in smaller segments. I can’t sit at my computer and write for 4 hours straight. I’ve always found having a plan to follow helps me write better posts. Without a plan I’ve been known to get off topic halfway through, or even worse, put it off until tomorrow. Following a blog post format also helps. No need to re-invent the wheel every time! I like the “more & less” exercise. procrastination and make a good use of your time. It also puts you back on the creative track. Thanks Henneke for a great post! Yes, reading is a good way to get inspired. I agree. Or doing another creative activity. Taking some time to draw, can kickstart my writing, too! I recently bought an old laptop that is much slower. I use it for writing, it will surf the net if I need some quick info, but it doesn’t whizz round like my desktop. That has now become my ‘writing’ computer and I’m loving it. As usual, a wonderful post with lots of great ideas. I love the more and less idea which can be applied to not only writing but anything you procrastinate about like exercising, cleaning etc. Yes, I agree. It’s a good way to think about what you want to achieve and how you are going to achieve it. We tend to think too much in terms of “more” and we forget to think about what we could do “less”. My main problem is not the short twitter type distractions, but the big, child-is-ill, take-a-week-off distractions. It takes me ages to get my focus back, plus in the meantime loads of other work piled up, which makes it so easy to push the writing aside again. Especially when the writing doesn’t come easy. I know all the reasons why writing my particular blog is so hard and yet I can’t seem to find a solution to make it easier. Yes, I know. That’s tricky. What might help is trying to find smaller pockets of time, and do what you can in those pockets of time. For instance, if you have a 10-minute break, could you think of a working headline? If you have another 10 minutes, could you outline your post, so you know what you need to write? Once you have an outline, it becomes easier to write parts of your post over a number of days. I’ve even written blog post sections on a 25-min train journey (typing clumsily on my phone). They are all great ideas Henneke. I often find I don’t even start the important bits, because I don’t know how long I’ve got (usually until the youngest wakes up). I think it’s really important when you have ideas to write them down – either in a little notebook or in Evernote. It is so easy to lose our thoughts and ideas, and that’s so frustrating. Try to trust that your headline will be good enough. We can’t always strive to perfection, and as soon as we Google something an opportunity to writing is lost. I know it, because I’ve fallen into that Google trap a thousand times. At least. A trap, that’s exactly what it is. This is so wonderful :). I’m facing those days where I’ve ton of ideas in my mind, but staring a blank screen seems like a norm. I just pushed myself to start writing on an idea I read yesterday, and here you go, I’ve created a 500+ words post ( action-packed advice ) that I can publish – with a dash of my personal experience. I’ve written to a potential editor for considering it as a guest post. I can’t believe how easily the crept up irritation got resolved. I’ve planned to study conversion copywriting and then write a post on whatever I study. This will be a source of ideas to kick me into consistency, and I’ll learning far more than mere reading. What do you think? I might not choose to publish what I write. That’s exactly how I got into writing. I wrote about what I was learning (copywriting). So yes, if you’re studying conversion copywriting, then it’s a great opportunity to write a few posts about the topic. And yes, once we know what’s blocking us, the irritation can be solved. Better not let it simmer! It’s amazing to see your response in affirmation. I guess I just hit the bull’s eye to learning in a structured way. Unintentionally, following what you already did feels great :D.
Terrific advice. I’ve definitely found a few extra hours by cutting my TV viewing right down (and I don’t miss it). I’ve also found that keeping a diary has helped me establish a daily writing routine. Nothing too grand, just a few thoughts and observations and feelings. It was hard at first. I’d never been a diarist before, and my initial entries were heavy on detail and light on emotion (dull, in other words). But by writing daily and reviewing earlier entries, my writing has improved. Your point about the more you write, the more ideas you get is very true. You become more aware of what material you should look for and gather. I now make notes during the day that I use as ideas for my next diary entry. Warm wishes from a cooler-than-usual Australia. My husband jokes that I don’t even know how to switch on the TV. This is a little mean, because I can switch on the TV and find a channel. But it’s true that I hardly watch TV. I treated myself to watching the Australian Open men’s final on Sunday morning (evening for you!). But sometimes a couple of months go by without me watching TV at all. George RR Martin has a very simple solution to not get distracted. He’s written those several millions of words of his ‘A Song of Ice and Fire’ saga “on an old DOS machine running WordStar 4.0, the Duesenberg of word processing software (very old, but unsurpassed)”! Great example of cutting distractions! Another vote for not relying on willpower but finding the right tools to get our writing done. Wow. This is so timely for me. My brain has become so undisciplined! I used to post every DAY! Now I’m thrilled with myself if I even get out one a month. That is sad. Just yesterday I began something called 750words.com, where members just write 750 words a day. Can be anything, and they count your words for you, and analyze your brain according to the vocab you’ve used, whether you were happy, contemplative, etc., while you wrote. They also count your word speed, etc. It is SUCH an incentive. Only one day into it but I see the benefits, already. For instance, I learned it would only take my about 18 minutes to write that many words. I feel pulled to beat that speed, to do better than yesterday, etc. We shall see. However, when I was writing daily, the trick was what everyone is saying here: no distractions from Internet. In those days, Internet had not made itself available where I lived yet. I was doing very well to find one moment in time when I could just post without driving to the nearest hot spot. Now days, I have great service. I see the problem quite clearly. Years ago, we writers used to joke and fuss about family interruptions, and part of the joke included locking oneself in the bathroom when the need to write was paramount. There was even a toilet plunger charm for charm bracelets that circulated for awhile. Well, since my Internet is so great these days, the laptop works in the bathroom just fine!! Ha! So I’m going to have to find something stronger than a locked door to get me out of this new bad habit of letting the www (whole wide world) interrupt me whenever it wants. That sounds like such a fun challenge. Are you allowed to edit your 750 words? Or are you supposed to just write and that’ll be it? Haha! And someone just unsubscribed because she hated the headline! Thanks for this wonderful post, Henneke! I see that you have also added a few great tips in the comments. Btw, I loved your headline – Dilly dalliers, indeed. Yep, I agree. And I think I also read some research once that even if you’re not a morning person, you’re often most creative early in the morning. So I just have to kickstart my hazy brain (a walk in cold weather is perfect) and get some writing done. It also sets me up for a good day when I’ve done some writing first thing. 1. finding an interesting or humorous twist to my posts. 2. making my posts brief and concise. Sounds like you and your friend are doing stellar team work. Most mornings I do the New York Times crossword puzzle to wake up my brain. I admire people who can wake up and immediately be productive and creative. Like a cold engine I need to rev mine up a little first. As for being productive, I keep this quote by Robert Louis Stevenson on my desk…”Judge each day not by the harvest you reap, but the seeds you plant.” I love that. That’s a great quote! Thank you for sharing. I recently felt the urge to start my blog: http://www.joannakouna.wordpress.com. After ~30 years of corporate life, I decided to take a break and felt the need to capture this transitional phase of my life, through blogging. Although this is not about business… A US friend told me about you, and I have started reading your articles,etc. Thank you so much for all the tips you provide. I wonder, do you have any guidance, ideas about a blog of my nature? My focus is on business blogs, and I have not had much experience with journaling. I guess it really depends on what you want to achieve. Many people write a journal-style blog to document their life. Some find it therapeutic, cathartic. Often growing an audience or monetizing a blog is not important. It’s really about what you want to achieve. If you have the budget, you may want to consider hosting your own domain name rather than relying on WordPress.com. This would give you more freedom to use plugins and design your site in your way. It also looks more professional (but again – that might not be so important). For the last few weeks my writing pattern has been really comprised. Not sure why but I’ve been more distracted than usual. I may take your tip about taking walks every once in a while to clear my mind..and also switch up how I wtite a post. Maybe start with the outline and work my way from that and end off at the introduction. Really great tips you provided here..especially about writing in increments of 25 minutes. The 25-minute slots work really well. It feels counter-intuitive to stop just when you’re in a writing flow, but a short break refreshes the mind and getting started after the break is much easier when you were in a flow before the break. Stopping when you hit a difficult point makes it much harder to start again. Thank you for stopping by again, Andrew. Keep writing!